Were you at Restaurant Club in Sydney on August 27? Look how much fun we had! There were 70 of us at Pei Modern. Chefs Mark Best and Matt Germanchis cooked salt cod croquettes, chicken parfait doughnuts, smoked kingfish with almond tarator, amazingly tender duck breast with intense radicchio puree, savoury cheese custard with pear soup and super-thin Anzac biscuit and a delicious chocolate ice cream with wood-roasted orange marmalade. Oh, and every course was matched with wonderful wine. Thermomix Restaurant Club is a restaurant dinner where dishes are cooked in the Thermomix and the chefs come and chat to us all. 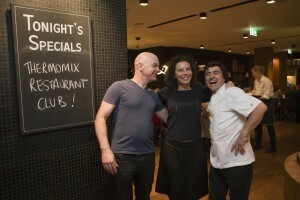 It brings together two of my big loves: Thermomix & restaurants! I’m the host of Restaurant Club (ie. I get to invite you all to my own party!). Click through to photo gallery.